If you’re concerned about your teeth and those of your family, there are everyday foods that will help keep your teeth and gums healthy. In general, foods rich in calcium, iron, magnesium, vitamin C, vitamin D and zinc promote your health, and specifically your oral health. Here are some tips for sneaking these vitamins and minerals into meals. There are a lot of little ways you can work more nutrition into your family’s diet. For good oral health, I recommend focusing on foods with vitamins and nutrients that can be added to (or may already be supplemented in) your kids’ favorite foods. 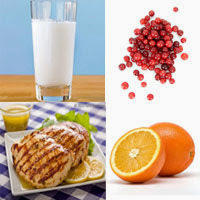 Below are some of the most essential vitamins and minerals for healthy teeth and gums. Calcium and vitamin D are available in dairy products, such as milk, cheese and yogurt. Try chocolate milk, pudding and hot chocolate, made with milk, for picky kids. If you can’t have dairy, some juices and breads are fortified with calcium, and dark-green, leafy vegetables (like spinach) also have calcium. Soy milk and other milk substitutes have calcium and vitamin D added. Grains and lean meats have iron, which promotes healthy gums. Rice bran is one of the highest sources of iron and can be added to muffins, breads and other baked goods. A good recommendation is oatmeal cranberry cookies with rice bran added – not only will the iron be good for your gums, but cranberries are natural cavity fighters. They prevent bacteria from sticking to your teeth and stop plaque from forming. Lean meats also have magnesium and zinc, for strong teeth. If you or your kids don’t like plain chicken or fish, try breading it with a mix of bread crumbs and parmesan cheese (adds some calcium to the meal). These additions make the meal look more like restaurant food (think “chicken nuggets”), but if you bake them instead of frying them in oil, they’re a lot healthier. Vitamin C is an essential vitamin for proper body health, including your teeth and gums. Low vitamin C can lead to bleeding gums, which can also lead to gingivitis. Eating fruits and vegetables like oranges, carrots, sweet potatoes and red peppers will ensure you get enough of this important vitamin. Hopefully all of these ideas will help you keep your family’s teeth and gums strong and healthy! A dental professional and currently works at a dental insurance company. She has done extensive research about dental hygiene and maintenance and often writes about current dental and healthcare issues. She is the the mother of two adorable children.